This class is a two day course that teaches sailors catamaran structure, components and features, performance under sail and power, boat systems, seamanship and safety, heavy weather operation, and emergency response. Students will learn to maneuver with a twin screw sailboat in tight quarters under control. Held from 9AM to 5PM both days at Coronado on our Leopard 40 Catamaran. 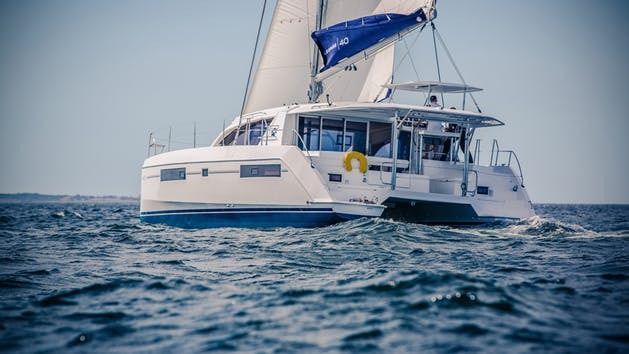 The perfect class if you want to try out our new Leopard 40 Catamaran and get certified on Catamarans by ASA! This class is a two day course that will run from 9am-5pm both days. The course teaches sailors catamaran structure, components and features, performance under sail and power, boat systems, seamanship and safety, heavy weather operation, and emergency response. Prerequisites: ASA 101,103, and 104. NOTE: This used to be held as a one day class, but due to new ASA standards the class is now held on two consecutive days.